HOORAY! Finally the day is here and the doors are now open at my Zazzle Shop! Zazzle is a unique, online marketplace that allows me to add my illustrative images to a VARIETY of goods and then offer them in a customizable way to you. SEE the examples below featuring just one of my images & how it can be applied to various shirts! These are just a few examples out of whole slew of products to choose from. 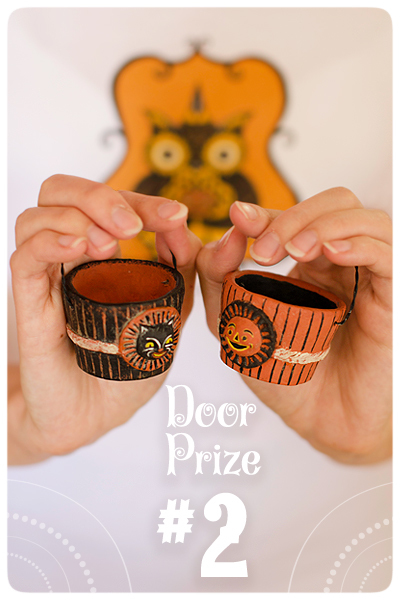 And as a Gift of Thanks for your patience and support, I am offering 3 Door Prizes to my patrons! To celebrate the first 3 weeks of my Grand Opening, I will be tossing your names into a hat. For every $25 you spend (before shipping fees) your name will be entered for a Door Prize. For example, if you spend $75 in my Zazzle shop during these first 3 weeks, your name will be entered 3 times! At 11pm EST on July 6th, this contest ends, and I will be drawing the winners! The winners' names will then be posted here on my blog! What's there to win you ask? Just keep reading, and please scroll down for my Tips on ordering my products on Zazzle. Make sure you save and bookmark the JohannaParkerDesign Zazzle Shop and visit often. THANK YOU! Yes, you're right! That's me flaunting my new Zazzle chandelier owl shirt! In surround, are a handful of styles you can choose from for the same design, and when you go to my shop, you'll see even more! For a peek at a recent At Home photo shoot, you can see JP and myself modeling a couple other designs of mine. Visit my "Gearing up for Zazzle" blog post. .... And here's a collage of various products that you can choose to place my art on! 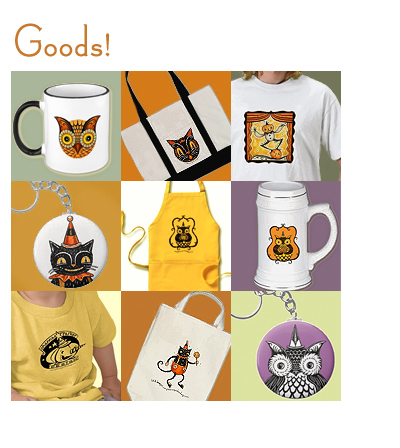 This is just a small sampling of the items available on Zazzle! Dear Patrons, You could WIN this ORIGINAL Mini Ghost Bust named "Boozazzle!" He is signed by me and dated, 1/1... and I just finished this little sweetie. 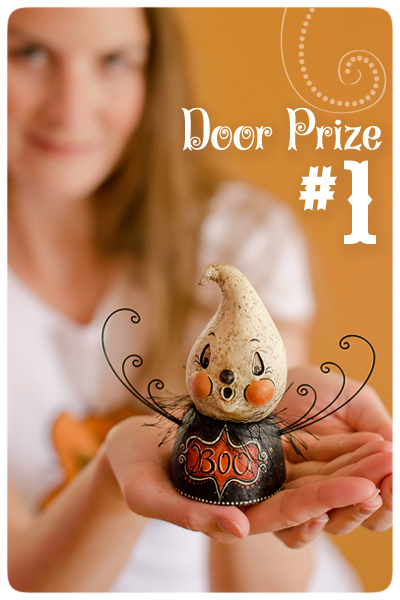 Again, every time you spend $25 (before shipping fees) in my Zazzle Shop, you will be entered to win this unique guy along with the other prizes listed below! WIN this pair of VERY LIMITED Nut Cups that I designed for Bethany Lowe Designs. As cute as they were, they never made last year's catalog, and only 70 of each were made. So, the winner of this prize will win a pair of collectible Nut Cups, marked 1/70, on the underside of each. 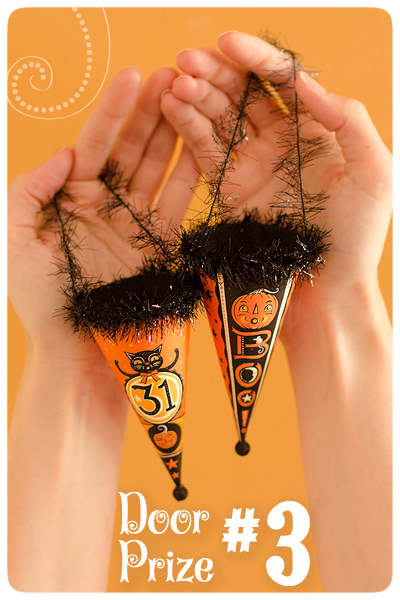 Straight from this year's product line of via Bethany Lowe Designs are these 2 illustrated cardboard cone hangers that I designed for Halloween. Remember, this Giveaway ends on July 6 at 11pm EST when the winning entries will be drawn. Please check back in July for the list of lucky winners and THANK YOU for celebrating my Grand Opening by shopping at my new Zazzle Shop and spreading the word to your family and friends! Now that I have had a few chances to order and purchase some of my items via Zazzle, I have learned a few tips that I would like to pass on to you! For the advanced user, you can also choose the orange "Customize It" button on any of my items! Under this option, you can resize and position the image. The magnifying glasses allow you to enlarge or reduce the image, but be careful not to enlarge the image too much as it will be cropped off at the edges. Also, the four arrows allow you to move the image up or down and side to side to your desired placement. Once all is looking right, PLEASE click on the "Design" Button right above the image and then click the magnifiying glass that sits to the right of the "Design" button. If the graphic stays within the dashed boundaries and no clipping is occurring, ALL is well! But, if you see that part of the text or graphic have disappeared, then resize it or move it appropriately so that this is not an issue. Otherwise, it WILL print that way ~ trust me! And for apparel items, you can click on the "Model" button above the image to see how it looks on a model! Now, if ALL of this seems too complicated, don't click the "Customize It" button to alter the image! You can certainly leave it as is, and you should be pleased with the results. Also, when ordering apparel, please scroll down and read Zazzle's sizing guidelines for each style of clothing. You'll notice that they offer NOTES on some of the items and may recommend that you order one or two sizes larger depending on the specific shirt, etc..... If you do receive an item that is not sized appropriately, etc... Zazzle has been very accommodating in replacing items until the customer is satisfied. And to simplify your shopping experience, I have organized my products into Store Categories. The row of folders going across the top of my shop help to guide you to specific products. Use the left and right arrrows to view all of the folders, and do take advantage of this feature in case you get a little lost as you scroll down the main page of products. Again, if you see an image that's not offered on a hoodie or perhaps as an infant's creeper, you can simply create what you want by clicking on they varying options in the "Choose your style and size" area. 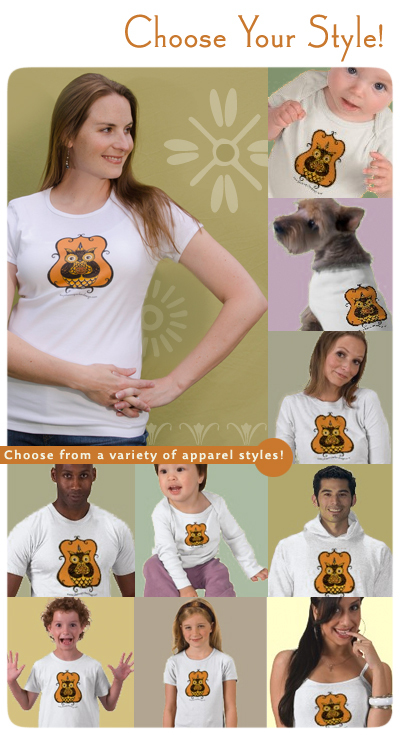 Fortunately, Zazzle offers you a preview of how each product will look! And if you have any troubles, please feel free to contact me or the Zazzle Team! Also, If you have any recommendations for illustrations not being offered on certain items, again let me know! I can certainly take note of your requests and update my shop as soon as possible with your favored suggestions. Thank you for your support! Spread the word and tell your friends that Johanna Parker Design now has a Zazzle Shop!